2. Nieuw Statendam’s stunning interiors were designed by internationally acclaimed hospitality designer Adam D. Tihany and Bjørn Storbraaten, one of the world’s leading architects working in the cruise industry. 3. In its first year, Nieuw Statendam will sail 92,723 nautical miles, more than four times around the globe. 4. The ship’s dedication ceremony will be held at a private event in Fort Lauderdale, Florida, Feb. 2, 2019. 5. 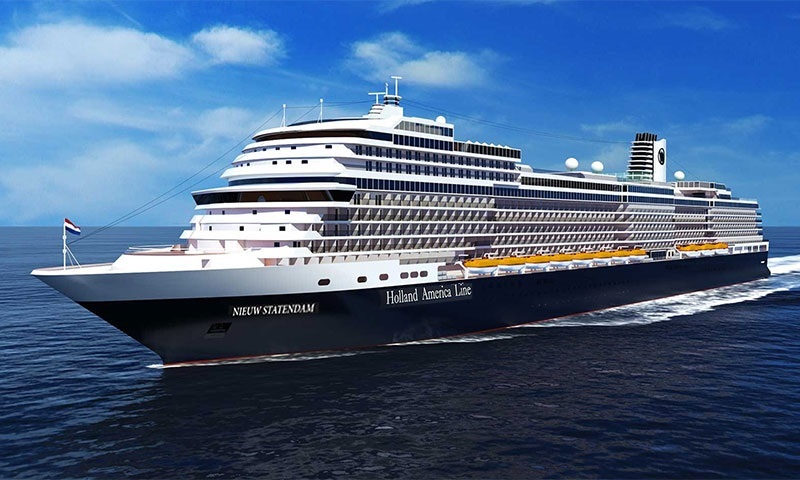 Twelve Seattle-based businesses are key partners in the building, launch and operation of Nieuw Statendam, which is important to Holland America Line as Seattle’s hometown cruise line. 6. Artists from 150 different countries are represented in Nieuw Statendam’s artwork. 7. More than 150 bottles of red wine will be made each month at BLEND, the first purpose-built wine blending venue at sea. 8. At 975 feet in length, Nieuw Statendam is a long as 12 blue whales. 9. Captain Sybe de Boer has been master of Statendam, Zaandam, Rotterdam, Amsterdam and Eurodam and served on Maasdam, Ryndam, Noordam, Nieuw Amsterdam and Koningsdam. 10. Two hundred pounds of pasta will be prepared at Canaletto during a seven-day cruise. 11. It would take 7,067 standard bottles of Champagne to fill Nieuw Statendam’s Lido Pool. 12. On a weeklong voyage, 9,331 towel animals will be created. 13. In the first year, 42,760 pounds of lobster will be served. 14. There are 1,920 works of art on board. 15. On a seven-day cruise, 4,200 cups of coffee will be served. 16. The hull of Nieuw Statendam is made up of 720 individual blocks. 17. In Lido Market on a weeklong cruise, 5,600 freshly made, personalized salads will be prepared at Wild Harvest. 18. The ship’s crew members represent 33 countries. 19. On a seven-day cruise, more than 42,000 eggs will be used. 20. More than 9,360 songs will be performed in Rolling Stone Rock Room during the first year. 21. Guests will indulge in 11,440 massages during the first year. 22. Pinnacle Grill will serve 600 pounds of Double R Ranch Beef during a seven-day cruise. 23. Nearly 20,000 guests will attend a Digital Workshop powered by Windows class in the first year. 24. During a seven-day cruise, 3,000 burgers will be served at Dive-In. 25. Seventy performers will grace the stages of Music Walk during the first year. 26. Eighteen different flavors of gelato will be made on board each cruise. 27. In the first year, 260 live America’s Test Kitchen shows will help our guests master their home kitchens. 28. Grand Dutch Café will serve 1,250 beers on a seven-day cruise. 29. New York Deli & Pizza will serve up 350 breakfast sandwiches on a weeklong cruise. 30. Nieuw Statendam is a sister-ship to Koningsdam, which was delivered in April 2016. A third Pinnacle-class ship will be delivered in 2021. Nieuw Statendam sets sail on its 14-day Premier Voyage from Civitavecchia (Rome), Italy, to Fort Lauderdale, Florida, Dec. 5, 2018. The ship then spends a season in the Caribbean before returning to Europe for summer explorations to the Mediterranean and Norway.